I have received so many unexpected gifts since my Epilepsy diagnosis. The biggest gift was time. My injuries made employment difficult and I left full-time work almost 5 years ago. Several months later my Grandmother (then 91 years old) decided she should stop driving but she was still mobile and needed occasional rides. Since I was available to help, I started picking her up on Friday mornings and taking her to the grocery store while she did her shopping. It wasn’t long before I was doing all her shopping and then going to her apartment two days a week to help with various tasks that had become difficult for her. They were easy tasks for me, but for her would take all day and wear her out. I made up the bed, watered her plants, swept the balcony, fixed her lunch, refilled the frig with Cokes for the maids who cleaned every Wednesday and her own Diet Caff Free Cokes, refilled her Hershey’s Almond and Toffee Nuggets, opened her weekly bottle of wine, opened the milk cartons, popped open the child-proof caps on everything that was unopened, painted her fingernails and even filed and painted her toenails. Each day she would have a little list of what needed to get done. We chatted the time away with current news, updates from out-of-town family, Mom’s worldwide travels and my family adventures with growing boys. We teased each other when my noon alarm rang, reminding me to take my medicine and her to take her Parkinson’s medicine. Occasionally we would argue and accuse the other of not knowing what they are talking about. I would tell her she’s old and forgetful. She would tell me I fell. Back and forth we went. Two heads are always better than one, and with loads of humor in the midst, we would eventually get there. Hunter was not in preschool for the last nine months before he started Kindergarten. I already had my routine in place with Emmer. She counted on me being there every Tuesday and Friday. I figured he was 5 years old and could manage to occupy himself for a couple of hours when I was there. Just as Emmer and I had already established our routine, he quickly fell right into place and established his own routine. We stopped at the grocery store each day to pick up what she wanted. I carried the list and he followed behind with the small buggy. 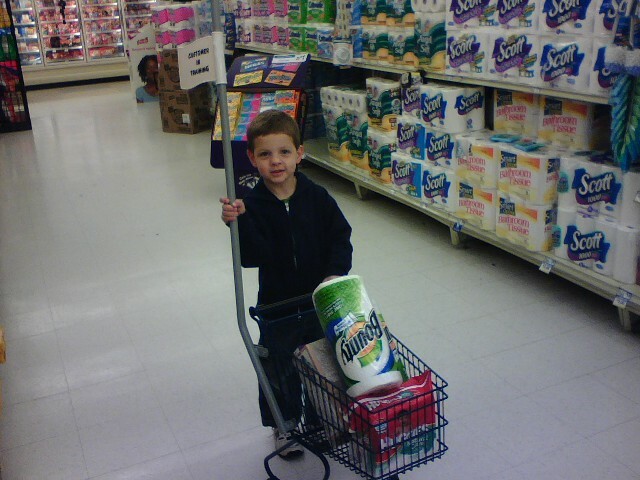 Eventually he knew exactly what supplies she would want and which aisle to find them. He helped me carry the bags to her apartment. I took the steps to the 3rd floor and he always took the elevator by himself (proving his independence at an early age). He peeked in the door each day and looked for his special treat, one Andes mint, always sitting and waiting for him on the dresser in the entry. He headed right for her as she sat seated on the far left side of her sofa sipping super hot coffee and reading the newspaper, cover to cover. They greeted each other, shared hugs, he thanked for the candy and then escaped to her bedroom to curl up in her recliner and watch cartoons. When it was time to make up her bed, he assumed his position on the right side of her bed and helped pull up the sheets and tuck them in tightly just the way she liked them. He carefully placed her two pillows on the bedspread and fluffed them, just before patting them down into place without a wrinkle to be found. When he heard me pick up the keys, he knew it was time to head to the main entrance to get her mail and stop at the bank. His job was to carry the keys and open the post office box. He sorted the junk mail and dropped it in the recycle box and put everything else in the plastic bag we carried. We stopped at the bank where the teller kept his favorite lollipops. He always took two, claiming one was for his brother, though I’m fairly certain Justin never actually got a single lollipop. This was our routine. Day in, day out. This was what we did when we went to Emmer’s. We had tasks to accomplish and a correct order in which to do them. When I was taking too long he would get visibly antsy. Emmer always knew when she needed to step in and occupy his mind. She told him she was going to teach him something important that he would need for the rest of his life. She taught him how to count coins. He would wheel her walker to her and dump out some change onto the seat of her walker. She started with the basics showing him the coins, letting him hold them, study them, feel the weight, the sides and the see the color. She taught him how to identify the coin and then taught him the value of each coin. Eventually he understood enough that she began to teach him how to add them all together. I can see them right now. I would stand in the kitchen doing my chores and peek through the open shutters into the living room where he sat at her feet. His eyes for trained on the seat of her walker and all that bronze and silver as her petite hands would move them about as she reminded him what each coin was. When he got lazy and started guessing, she was quick to correct him. She would say “Now Hunter, you are guessing. Pay attention and tell me what this coin is.” He would refocus and follow her instructions. Two generations apart, these two connected with each other. Hunter will carry that with him forever. Had I not had the gift of time he would never have had this gift. My injury…an unexpected gift that will last forever. I didn’t realize the impact these times had on Hunter. This week he came home from school and told me they were learning how to count money in class. “Mom, people in my class don’t know how to count money. I know how to count money. My Great-grandmother taught me how to count money. Not my Grandmother, but my really really old Great-Grandmother. Most people don’t have a Great-grandmother, but I do and she’s really old. We used to go help her when she lived in her own apartment. She taught me how to count money. She would ask me how much an orange drink cost at Cashions. It’s always been .69 but she never remembered that. She always asked how much my favorite drink was and sometimes, if I had done well with my counting she would let me count up to .69 and take it with me to buy my own drink. But we had to get enough money without using the quarters. She kept the quarters for playing bridge with her friends, so we had to count up enough dimes, nickels and pennies. Sometimes if it was a really special day she would give us enough money to go buy Happy Meals for lunch. I loved that! Oh…..how I miss those days.” Then he smiled, propped his chin on his hand and stared out the car window. I smiled too, knowing that he had a treasured gift. Those nine months gave him memories that will live with him forever. A life-changing injury gave all of us gifts. The gift of time for each other. The gift of time among generations. I will treasure these gifts, for generations to come. This entry was posted in Epilepsy, Faith, Family and tagged Family.